Our state-of-the-art digital Trap Voice Release System is SIMPLE to set up and very easy to operate. Each of the 5 microphones operates continuously, so there is no need to sequence, adjust or reset the system if you have a "NO BIRD" or even a short squad. VERSATILE - For use in Trap, Wobble Trap, True Pairs etc. - Easily portable between stands. SET UP - Just plug in the power supply and microphones. Connect to the release button cable of any trap and it's ready. OPERATE - No complicated settings or adjustments. POWER - 12V,120V & 240V options. ACCURATE - Consistent trap release time - every time. - Advanced filtering minimizes unwanted noise related triggering. - Optional voice command delay mimics human timing. 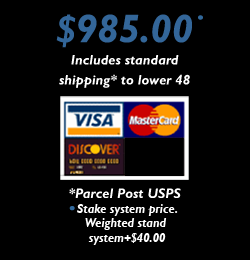 REDUCED COSTS - No need for a human puller. 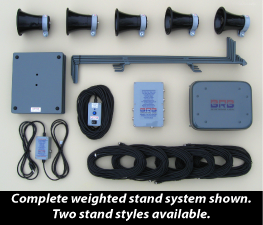 These professional grade systems are mounted on one stand and employ one user microphone and will fit any auto trap. Sporting and trap disciplines ready. Ideal for the club, training purposes, or personal use, these systems incorporate the same superior background noise elimination as our Trap Voice Release System. Designed to be free of setup or adjustment complications. Just plug it in and Go! These compact and rugged systems are now available in 12V, 120V & 240V versions. Two stock models are available. This system operates one trap and can be used for the release of singles and following pairs. This system operates two traps and can be used for the release of singles,following pairs, true pairs and report pairs. We offer options for either of these systems to be built to suit your specifications, to satisfy any and all of your shooting needs and conditions, such as multiple microphone versions for additional shooters. All units will be built capable of accepting our new counter system. In keeping with our belief in easy to operate and use equipment, our new counter system is free of complicated buttons, knobs, or computer menus. This is another "Plug and Go" system made to plug straight into any of our Voice Release Systems, without the need to run additional cables. It is also made for easy connection to other systems. Operation will require no computer science degree, leaving you more time to break clays.